After the keynote, the Learning Management Colloquium started with an introduction by Lance Dublin, then ‘deep dives’ by Bryan Chapman, Michael Echols, and Marc Rosenberg. This is a separate stream within the Guild’s Annual Gathering, though this year it’s open to everyone. I’ll be representing ‘games’ in the Espresso Learning session tomorrow. Lance started talking about Web 2.0 and management, with the increasing information overload and how kids these days are coping with prosumption and democratization of content, and that we had to take advantage of these approaches to cope. He created a distinction between informal and non-formal learning, arguing the latter is what we can actually control, and should be thinking of. I think Jay Cross wouldn’t mind separating out the measurable from the ineffable, but would suggest we should still be thinking of things we won’t necessarily track including things as broad as designing floorplans to promote interaction (such as Sawyer talked about in today’s keynote) as well (and probably quibble about the importance of tracking). Bryan Chapman talked about learning technology infrastructure, and in the audience interaction pointed out how broadly divergent were the LMSs used, more commonality in authoring tools, and then divergence again in virtual classroom tools. Also evident was that people confused portals with knowledge management. My real takeaways were the recommendation of having a high-level, cross-business unit performance council and standard-setting group. where delta is new performance metric – old performance metric. It’s a nice contrast to the Kirkpatrich ‘chain of argument’, where your improvement is based upon measured comparisons at each level, and arguing that they’re connected. On the other hand, it requires having that baseline or control group! Still, delightfully principled. Finally, Marc Rosenberg gave his usual, but still important, spiel about elearning needing to be more than courses. 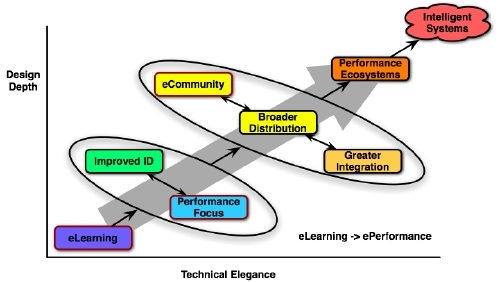 His list of elements has a different cut than mine – he has six elements: ILT, WBT, Knowledge Management, Performance Support, Community of Practice, and Experts, where I have a different six: eLearning (w/ Advanced ID), Performance Focus, eCommunity, Greater Integration, and Broader Distribution, leading to a full Performance Ecosystem. We agreed afterwards that the lines aren’t clear cut and each served our purposes. First thing in the morning I had a Breakfast Byte on eLearning Strategy that was well attended, and presenting my models seemed to be well-received with nods when I queried whether it made sense and several thanks afterwards. I was clear that it wasn’t an answer, just a framework to be customized, but has proved valuable for me. Overall, a valuable first day.